Zorra from Kochtopf is hosting Weekend Herb Blogging and this week, I've come up Apples! 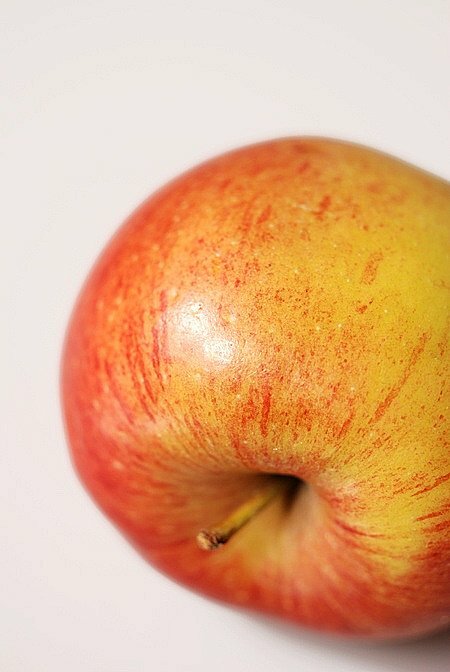 While we claim the Granny Smith, Braeburn Apples have their origins in New Zealand (Would it be facetious to make mention that the Braeburn is an offspring of the Granny Smith?). They are characterised by a streaky skin in red and orange tones. It's a juicy apple with a sweet but crisp finish and when cooked, tends to keep its shape. Having just purchased Michel Roux's latest Pastry it supplied me with the perfect use for these apples - a filo pastry strudel! If you don't have Braeburn's then the Cox apple makes an excellent substitute. 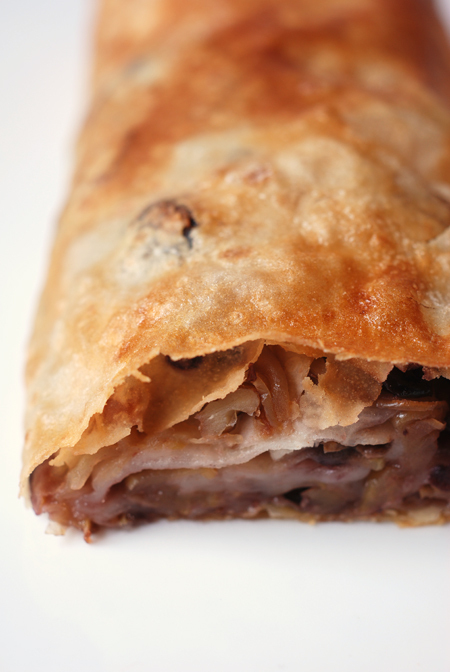 This version of strudel certainly got my attention due its unusual method. Instead of just piling the fruit in one spot, the apples are very finely sliced and layered over all the pastry - it's then rolled to form a spiral of alternating layers of apple and filo. 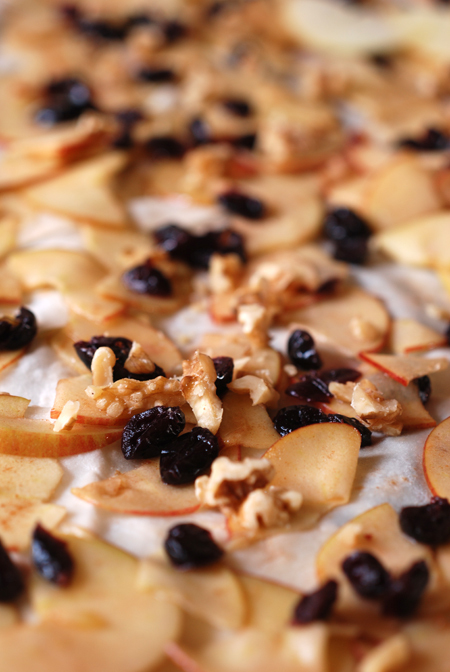 While the original used raisins I've replaced them with dried bluberries and for a little extra crunch, walnuts. Take a cup of boiling water and pour it over the dried blueberries. Let this sit for 5 minutes, then drain. Halve the apples, core, and then slice very finely. Place the apples into a bowl along with the drained blueberries. Put the lemon juice, sugar and cinnamon into a small dish - stir to dissolve the sugar and then pour over the apples, tossing gentle to ensure the slices are well coated. Let this sit for 15 minutes. I am using a rather rustic filo that certainly looks like it is made by someone's Greek gran and it is a bit thicker than the commercial varieties so only one sheet is needed. If you were making this with commercial pastry you'd need to use multiple sheets, each layer buttered to the next to provide the necessary strength. The sheet I used was roughly 55cm square (23 inch). Drain the apple slices really well before using. Leave the top quarter of the pastry uncovered as well as an inch on the sides - cover the rest of the sheet in a single layer of the filling. Scatter over with the walnut pieces. 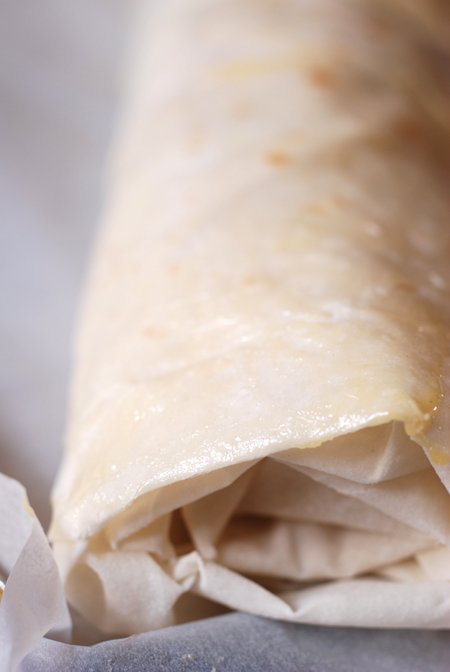 Fold the inch border over the filling and then begin to roll the filo to form a sausage shape - when you reach the uncovered section, brush this well with melted butter before continuing to roll. 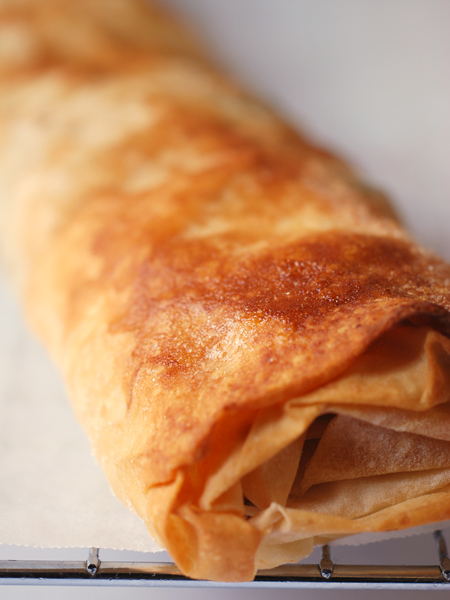 Place this onto a baking paper lined tray and brush the top with butter and give it a light sprinkle of caster sugar. Bake in a preheated 180°C/350°F oven until golden - this will take around 30-45 minutes depending on the type of pastry you have used. Let it stand on the tray for a few minutes before sliding it onto a wire rack to cool. 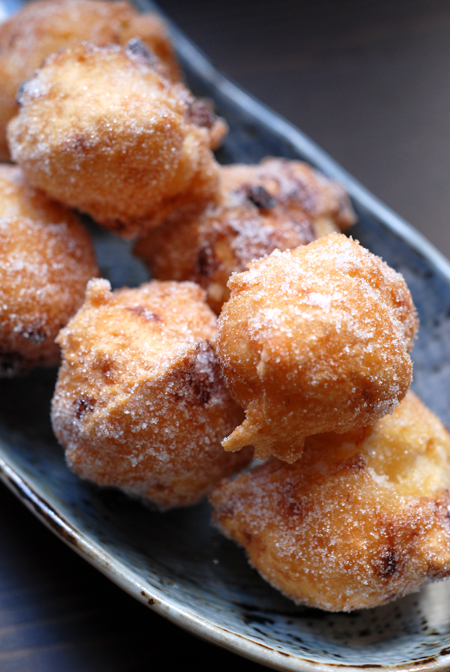 It's certainly a new twist on an old favourite but utterly delicious! Wow, that does look fantastic. I love Braeburn apples which my store sometimes has. Now that I have the braces, cooked apples sound a lot more appealing for the next little while! That looks really good and I like the unusual method. My husband loves Granny Smith apples, but they are too tart for me! Thanks Kalyn - they are pretty good apples. 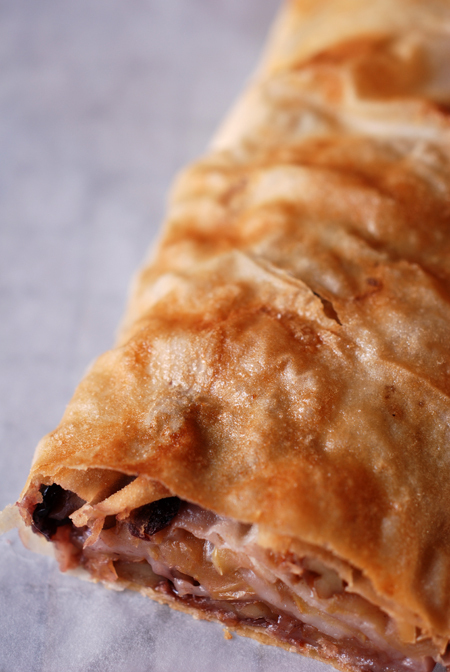 Great looking strudel, and I love that filo you used! Pity I haven't seen any of it here..